Stainless steel case with a two-tone (silver and gold-tone) stainless steel link bracelet. Fixed gold-tone bezel. Silver dial with luminous gold-tone hands and index hour markers. Diamonds mark the 3, 6, 9 and 12 o'clock position. Dial Type: analog. Luminescent hands and dial markers. Quartz movement. Scratch resistant mineral crystal. Texture gold-tone crown. Stainless steel case back. Case diameter: 27 mm. Case thickness: 5 mm. Band width: 14 mm. Fold over clasp. Water resistant at 30 meters / 100 feet. Functions: hours, minutes. Additional Info: luminous gold tone hands and hour markers. Gold tone metalized rim. Pitched regate hands. Dress watch style. 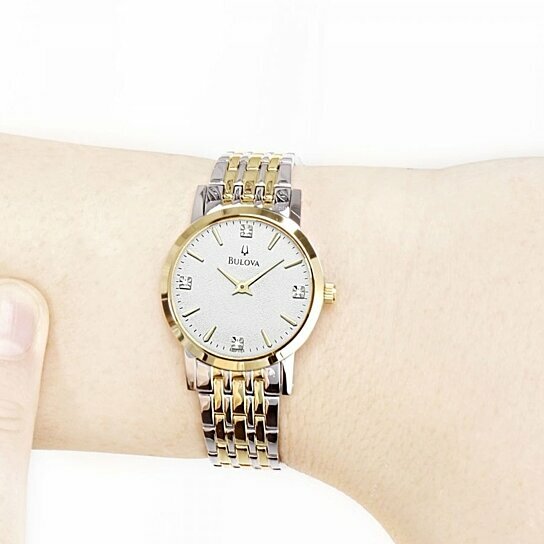 Bulova Casual Diamonds Ladies Watch 98P115.